As we’ve noted in previous articles, countries around the world are liquidating U.S. Treasuries at an alarming rate, with China moving the fastest to unload its stake. The motivations behind China’s rapid selling of U.S. Treasuries aren’t clear. Some believe it’s a jab at the U.S. economy; others think it’s a gesture of skepticism in response to the impending Trump presidency. But there’s another key factor to consider when we ask ourselves why China would start dumping its treasury holdings so abruptly, and that factor could turn out to be important for the gold market too. When a country like China decides to sell off a portion of its stake in U.S. Treasuries, it immediately results in a bump in its cash reserves. The same way you would get cash back after selling shares in a stock, bond, or mutual fund, countries get cash back when they liquidate their U.S. Treasury notes. Which raises the question: Is China hurting for cash? You might be surprised, but the answer is yes. Despite the overwhelming growth and size of China’s economy, it’s struggling to keep cash inside its borders. The people and businesses of China are eager to exchange their Yuan for other currencies in the global market. How eager are they to make this move? Eager enough for the Chinese government to put a hard cap on the amount of Yuan a Chinese citizen can convert to other currencies every year. And the problem isn’t getting any better. Chinese officials are expected to implement even stricter regulations in coming months. China’s continual outflow of cash has one painful side-effect: devaluation of the Yuan. As officials fight to keep cash inside the Chinese economy, the Yuan is growing weaker by the day. Selling U.S. Treasuries is a way for China to temporarily offset its currency problems, which is likely a big part of the reason why we’re seeing such a large, prolonged selloff. Chinese officials know they have to find a way to keep cash from leaking out of their economy, but that won’t happen overnight. So, they could be forced to keep liquidating treasuries for the foreseeable future just to support the Yuan and keep its capital reserves stable. Given this context, we may better understand the incentive for China to sell treasuries at its alarmingly rapid pace of late, but there’s still a looming question here. If China has to rely on treasury sales while it figures out how to fix its currency problems, what happens if China runs out of treasuries to sell before those problems get fixed? At its current rate of liquidation, China will be out of treasuries to sell in roughly two and a half years. 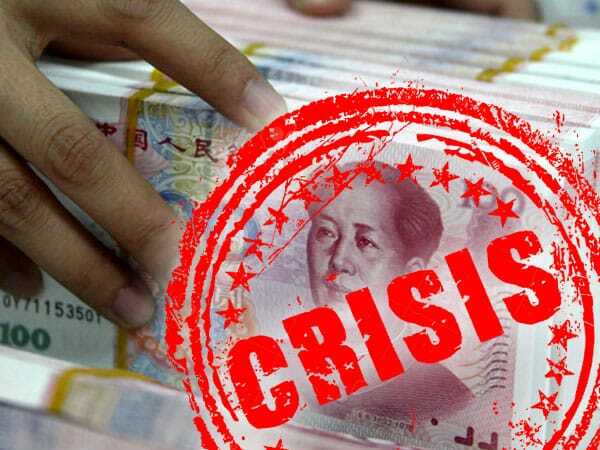 After that time, in the event the Chinese economy is still struggling to retain cash and keep the Yuan above water, there could be a major currency crisis, and it could send shock waves throughout the global economy. As is true during any crisis concerning the value of a major country’s fiat currency (paper money), it’s extremely likely that people from around the world who are seeking safe haven will flock to gold. Ultimately, this may prove to be good news for anyone who owns gold or plans to in the near future. If you needed yet another reason to balance your savings with a protective investment in gold, this is it.